Gwendolyn Keyes Fleming became the EPA’s chief of staff in June 2013. She is a graduate of Emory University School of Law and formerly served as district attorney for DeKalb County. Gwendolyn Keyes Fleming 93L, chief of staff of the Environmental Protection Agency, will be the keynote speaker for a series of events held at Emory Nov. 20-21 in conjunction with the university's 7th annual Green Networking Night. • 3-4:30 p.m. Public lecture "Expanding the Conversation on Environmentalism: What Does It Look Like in Your Community," at Rollins School of Public Health, Claudia Nance Rollins Building, Room 8030, followed by a reception. Open to members of the Emory community. Contact: Robin Thompson. • 6-6:45 p.m. Green Networking Night Pre-Reception in Cox Hall Ballroom. Sustainability professionals by invitation only. • 6:45-8:30 p.m. Green Networking Night event in Cox Hall Ballroom, including keynote. Sustainability professionals by invitation only; event open to current Emory University students. Sponsored by the Career Center, Office of Sustainability Initiatives, Emory Alumni Association, Turner Environmental Law Clinic, and Environmental Law and Conservation Society of Emory Law, among others. Contact: Paul Bredderman. • 12-1 p.m. Emory Law School Lunch and Learn: "A Lawyer's Role in the Next Generation of Environmental Protection," Environmental Law and Conservation Society, Gambrell Hall, Room 575. Open to the Emory Law School community. Contact: Mindy Goldstein or Jennifer Lamb. Fleming was appointed by President Obama as Region 4 (Atlanta) regional administrator of the EPA in September 2010, the first African-American to hold this position. In June 2013 she became the EPA's chief of staff, serving as a manager of the Office of the Administrator and senior adviser to agency leadership. 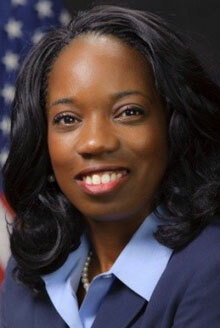 Before joining the EPA, the former Lithonia, Georgia, resident was the first woman, first African-American and youngest person ever elected as DeKalb County's solicitor general. She subsequently became the first African-American and the first woman to serve as the county's district attorney. Fleming holds a bachelor's degree in finance from Douglass College at Rutgers University and a degree in law from the Emory University School of Law. A recipient of numerous awards and honors, she is a former member of the Emory University Board of Visitors, chair of the Black Law Student Advisory Committee, and has served on both the Emory Law Alumni and Advisory Boards. She is a past president of the Emory Law School Alumni Association and received the Distinguished Alumni Award in 2007.